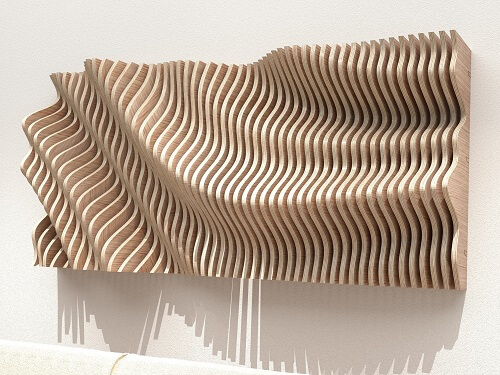 Aguaviva is the third piece in David’s Strata range which uses multiple layers to create a sense of movement. 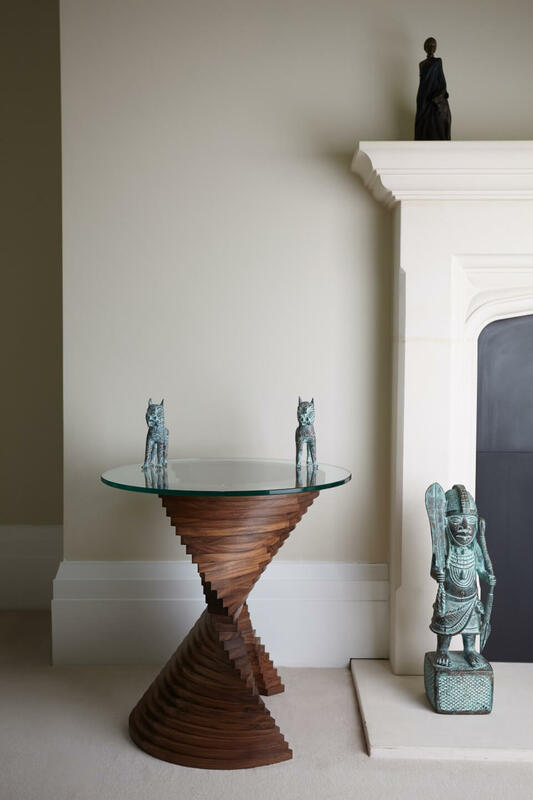 This piece is made up of a total of 93 pieces of solid wood which are carefully joined together to produce this dynamic sculptural side table. 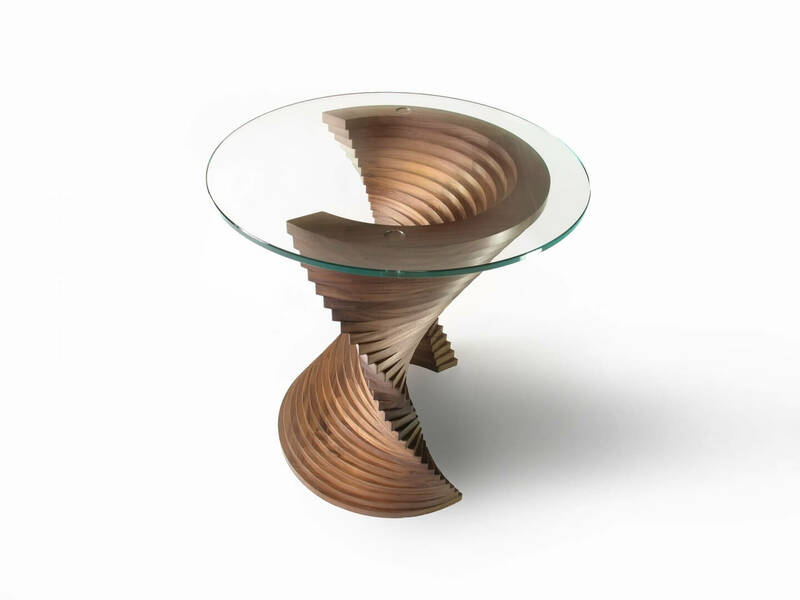 The top 16 layers of this table capture the sense of movement, as the jellyfish (aguaviva in Spanish,) propels itself in its marine environment. 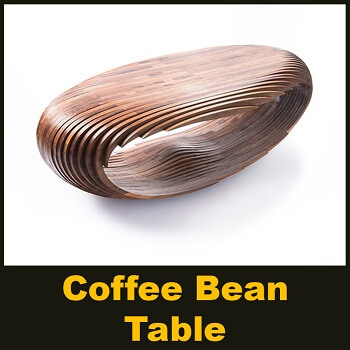 This design can be tailored to various sizes to suit your needs, whether as a high table, coffee table or dining table as well as being available in different timbers. Posted in Digital Fabrication and tagged Laser Cut. 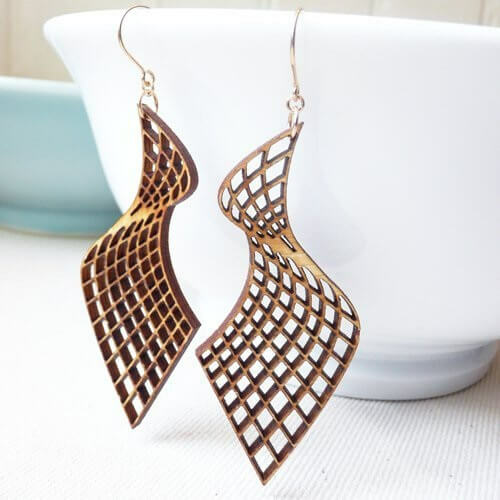 Wooden Earrings Designs & Ideas #2: You don’t have to be a geek to appreciate these bamboo earrings, inspired by 3D modeling programs.14k gold-filled hardware. Measures 3.125″ x 1.125″ including hook. 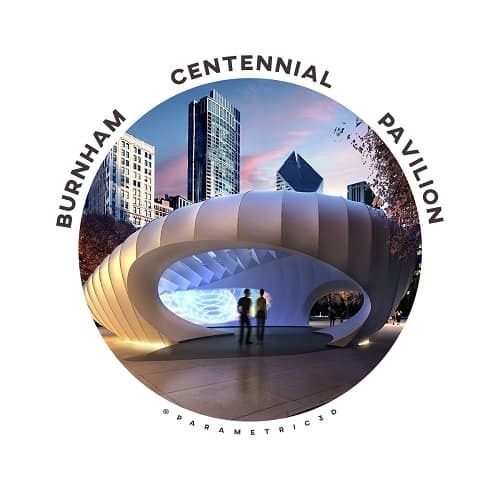 Ultra light-weight and eco-friendly. Designed + Made + Packaged in Southern California. 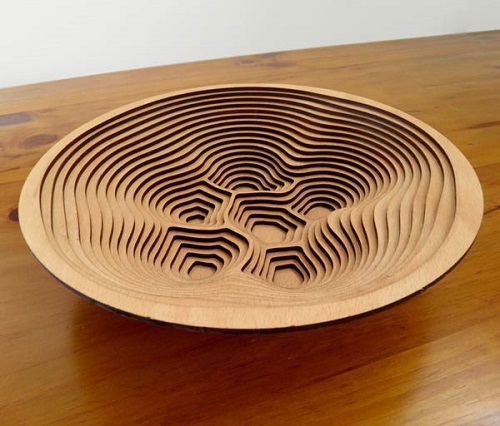 Wooden Joinery Design & Ideas #1: Laser cutting is widely used by industrial designers and mechanical engineers as a rapid modeling tool. 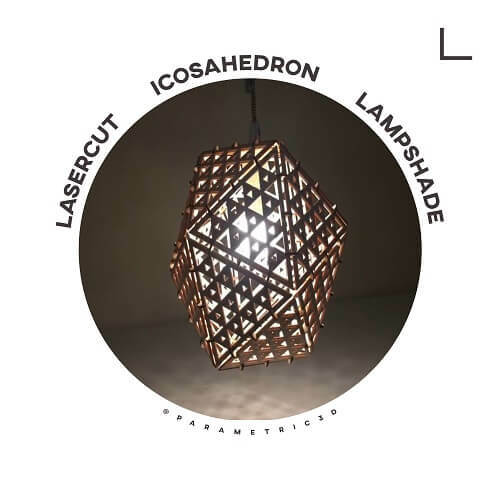 However, designing and fabricating laser cut assemblies can be a complex and tedious process, especially for novice designers. Joints between different parts of an assembly is a key aspect of translating a digital model into a physical model through laser cutting. Joinery was developed to facilitate this rapid modeling process as a parametric joint generation toolkit for laser cut assemblies. Wooden Coaster Designs & Ideas #1: We engrave all our coasters with our laser cutter that precisely carves out each unique wood piece. They’re perfect for gifting to a friend or resting your own drinks. Set of 4 wooden coasters, each individually waterproofed to last for years to come. Crafted from certified sustainable wood and made in our sunny LA studio. 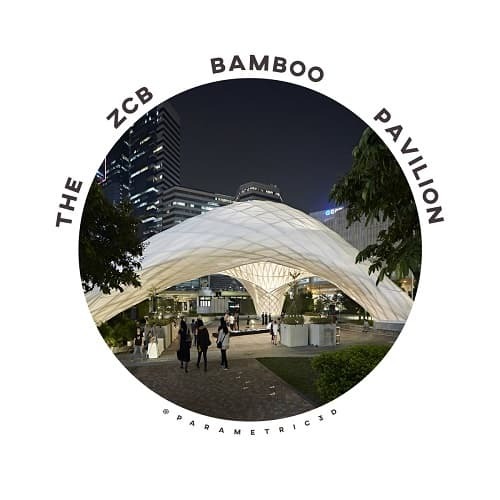 The ZCB Bamboo Pavilion is a public event space built for the Construction Industry Council’s Zero Carbon Building (ZCB) in the summer of 2015 in Kowloon Bay, Hong Kong. 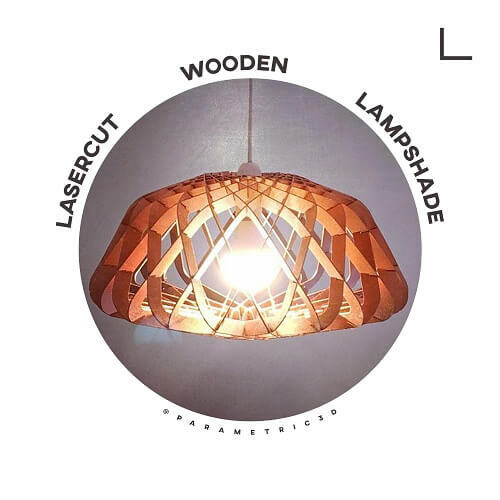 Here is a video about Cutting and assembly of a laser cut wooden lampshade. Wooden Wall Clock Designs & Ideas #3: This clock is made of real wood with natural texture and it’s ready to hang, no assembly required. Size (In Inches): 11.5” diameter, Size (In centimeters): 29 cm diameter. 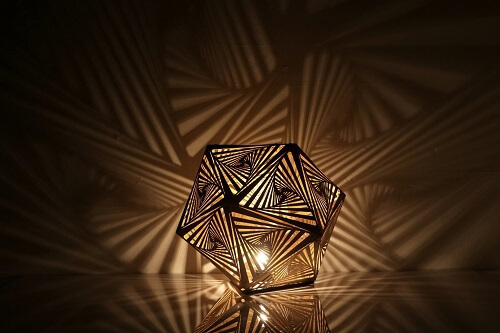 Wooden Table Lamp Designs & Ideas #3: A limited edition sacred geometry table light and sculpture. Will bring you into the magical world of Alice in Wonderland. 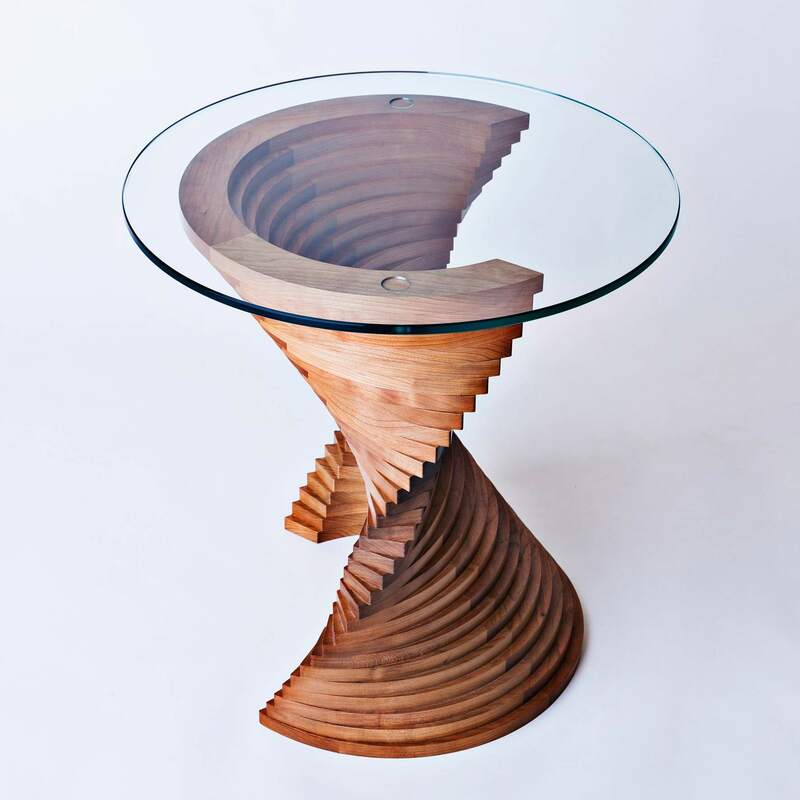 It has an 11 inch diameter on a wooden base. Easy to swap out the bulb. Includes: 6 foot black cord with switch, and a warm 7 watt incandescent bulb to cast stunning shadows. Wooden Wall Panel Designs & Ideas #1: Unique laser cut wooden panels for your home; this design was made possible using parametric design algorithms; One side finished in walnut, the other painted black – turn the panels around to double the possibilities; There is an infinite number of variations, we stopped at the best six, you can check the other pictures. 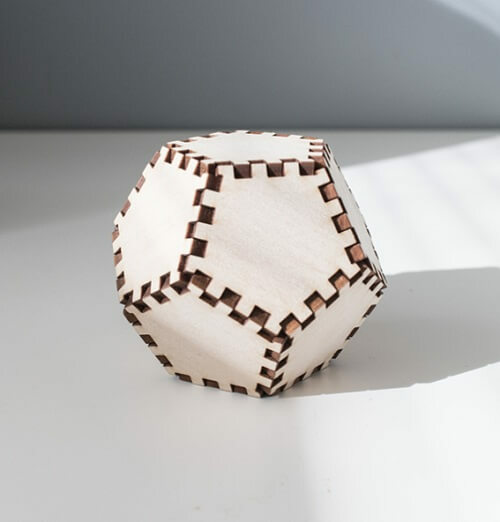 Each piece is precision cut by CNC laser, finished in walnut wood stain and finely sanded for a smooth feel. 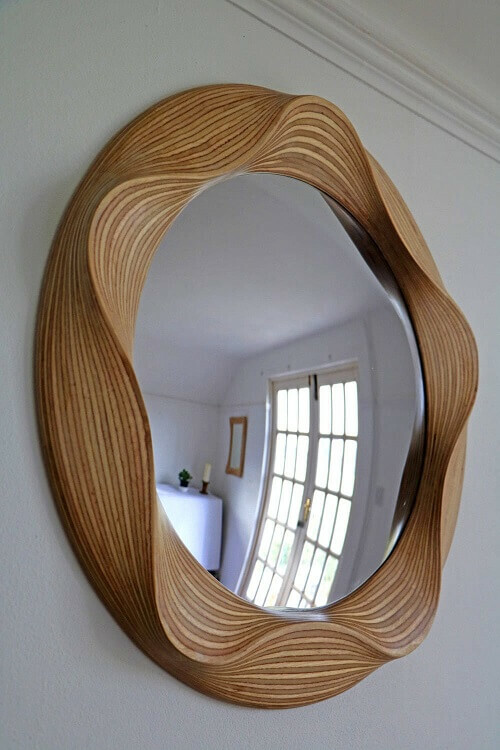 They are made from low density poplar plywood, which makes them light enough to hang even on the tiniest nails. You can also attach double sided tape on the back, for a more permanent finish on your wall. 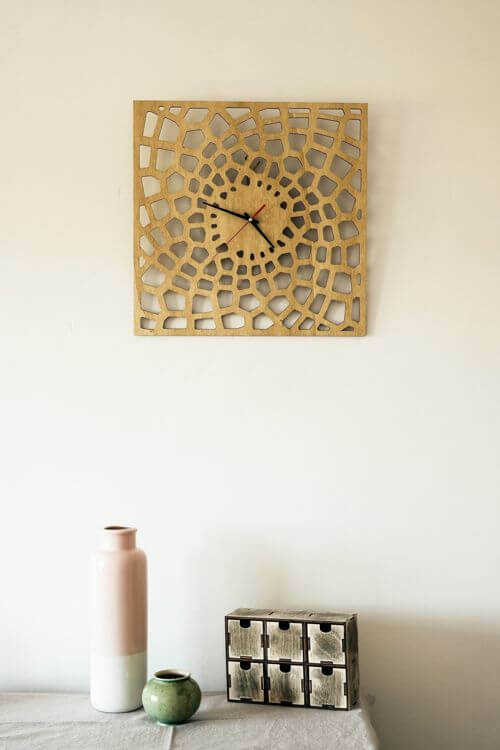 Wooden Wall Clock Designs & Ideas #1: Modern Voronoi wall clock for your living room, bedroom or the office. 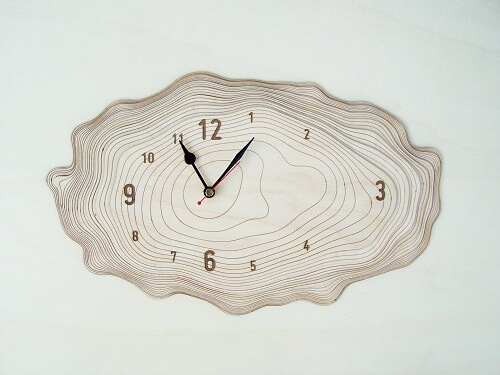 Made of wood, square, organic-like, no dials visible, it’s more of a statement than just an object that tells the time. It’s nature confined in a basic shape. This item begins as an ordinary plywood board. It gets cut to the desired size, finely sanded and then placed under the laser cutter, where our own custom-made-through-sweat-and-tears template is loaded. We take out the resulting pieces from the “oven” so we can finish it with wood stain. We sand it one more time, using fine sandpaper. This is all done manually – so all of those small imperfections hint that even though it’s laser cut, there are human hands that took over. 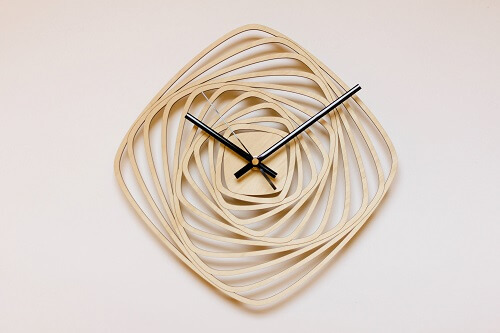 Wooden Wall Clock Designs & Ideas #4: This clock is made of seven layers of precisely cut and engraved wood. The layers of wood resemble the growth rings of a tree. The clock will mount flat to the wall because the mechanism is fit inside the depth of the layers. finishing: The front side of the wood has been sanded. background: Growth rings, also referred to as tree rings or annual rings, can be seen in a horizontal cross section cut through the trunk of a tree. Growth rings are the result of new growth in the vascular cambium, a layer of cells near the bark that is classified as a lateral meristem. 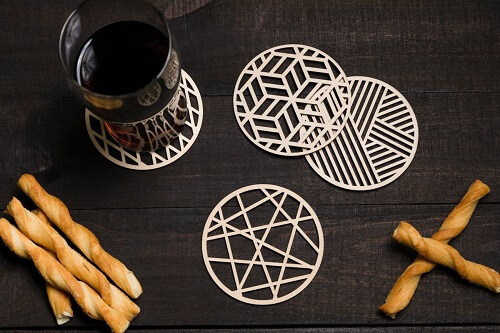 Wooden Coasters Designs & Ideas #2: Unique wood coaster set! In each set are 4 coasters. Great as home decor or gift to friends and family. 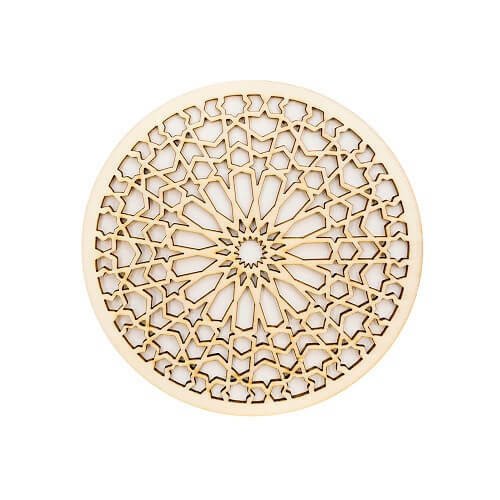 Each coaster is 3.9 Inches / 10 cm diameter. 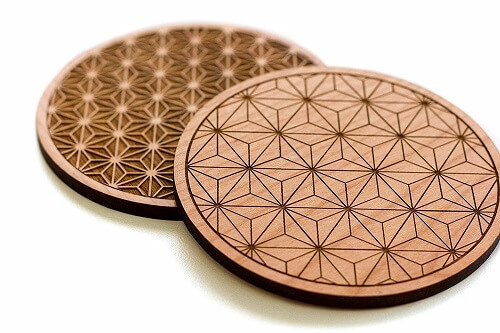 Each of our coaster is unique with natural wood texture. Made of FSC certified birch wood. 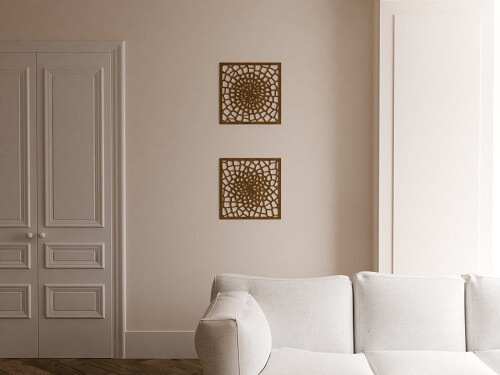 Wooden Wall Art Designs & Ideas #1: Dimensions: Length: 52″, Height: 24″, Width: 4.25″. The Phoenix Wall Fixture is the end result of pure, mathematical random data when channeled correctly. Born of “Perlin noise”, this piece is a small snippet of an infinitely distorted plane in space-time. In its default form, the wall panel is comprised of 55 vertical pieces of 1/2 inch Baltic Birch plywood attached with screws to three horizontal wooden bars across the back.The Phoenix Wall Fixture can be altered from its natural light-brown color, and can be stained or painted in a variety of different color options. 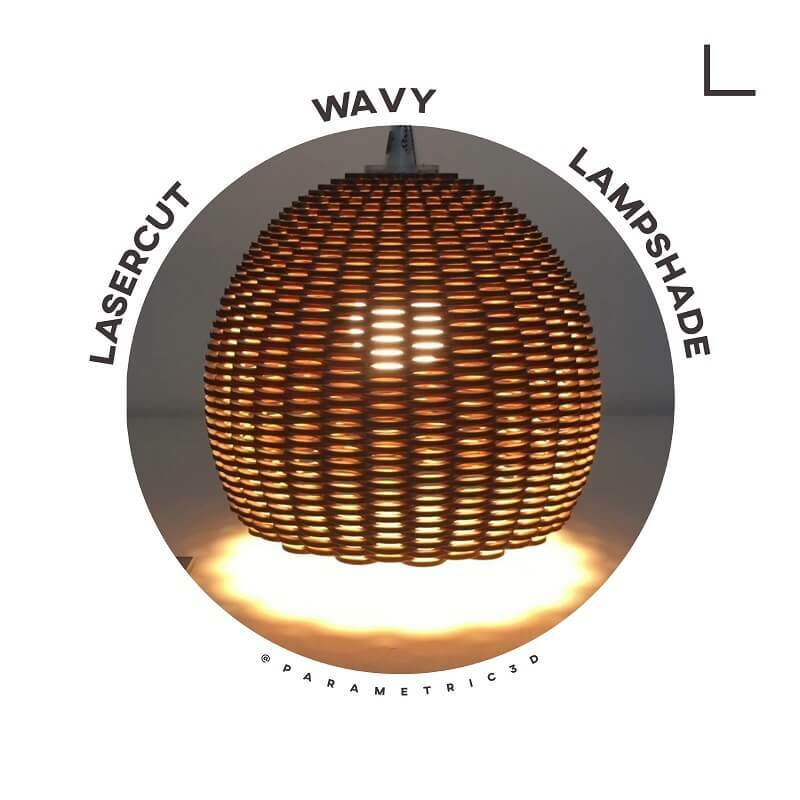 This lampshade with a notched “waffle” structural system brings the distinctive quality of light in your space. 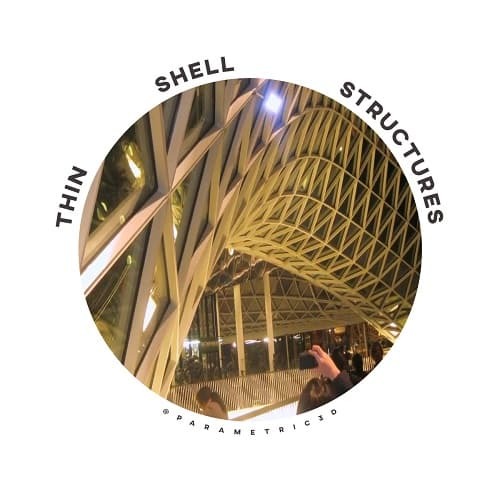 The parametric processes being used to design a unique object with interlocking 40 laser cut ribs. Human eyes could be easier to trick than you might think. 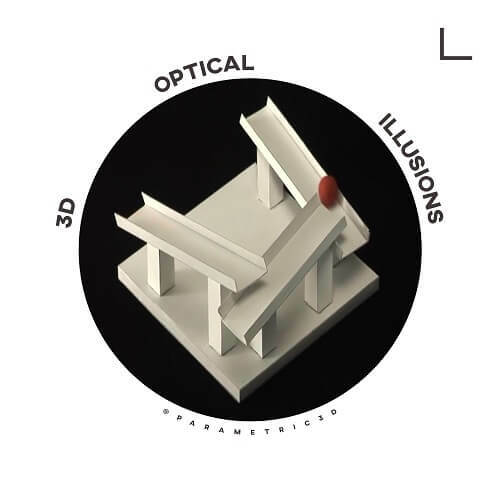 A Japanese professor, Kokichi Sugihara, created sculptures that trick the mind to see the impossible. He was the winner of the Best Illusion of the Year Contest in 2010 and 2nd place in 2016. 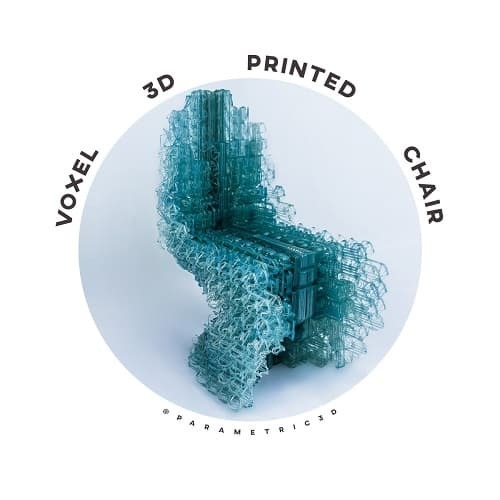 A continuous line of plastic makes up this intricate robot-built chair, designed using a new 3D-printing software by a team from the Bartlett School of Architecture in London. 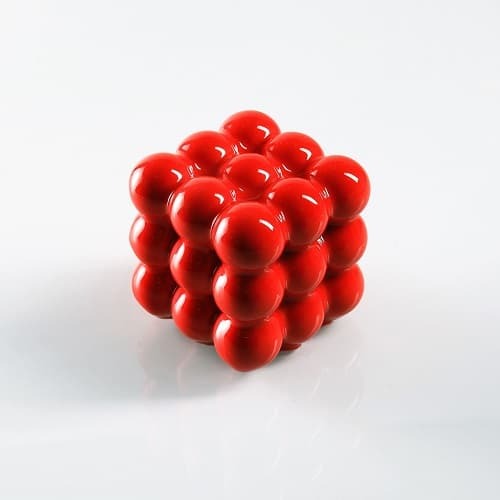 The Bartlett’s Design Computation Lab (DCL), a part of University College London, created the software to open up new possibilities for 3D printing. 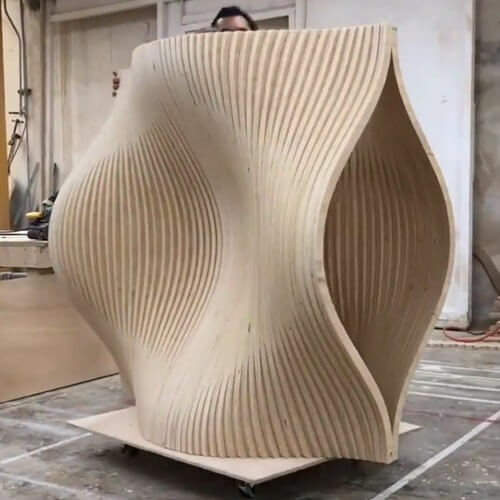 This video will show you the most amazing parametric chairs and genius wooden furniture.